Again, these pictures are taken in the morning, hence a little late. It seems so very interesting every beginning of the week (though I must say my week starts on Friday and ends on Wednesday because I work through the weekend) that a new ice cream is posted. I think the ice cream machine is the most used appliance third from my mixer and trusty oven. Who knew!! And I’m pretty glad I started on this little project though I’m not so sure if my waistline will actually appreciate it but oh well, at least their worthy. But I have to say, this is going to be the last Ice cream post here ….. Heh!! Did I make you pause a bit ? It’s the last time I’m going to put up an ice cream post here because… we’re going to have a new website!! We’re moving (We as in the blog) to my own domain. Whee how fun is that. Not. But it’s almost there, all the importing are almost done and re-categorizing of posts.. And the gallery. Almost almost.. 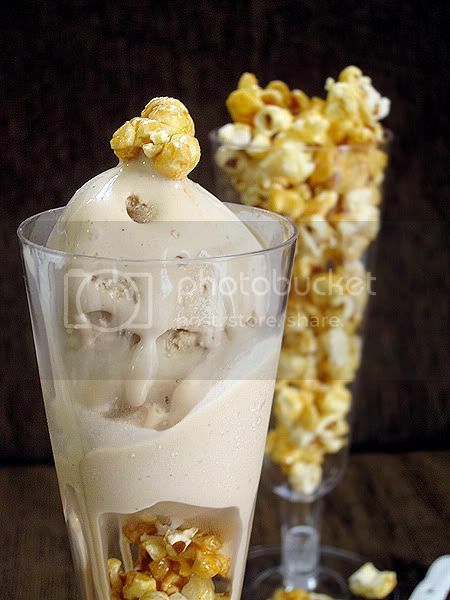 This popcorn ice cream came from Skye from Masterchef. I don’t know how many times I’m inspired by watching Masterchef Australia. Reality cooking shows are awesome! But anyways there wasn’t a recipe there so I simply had to pop up one. 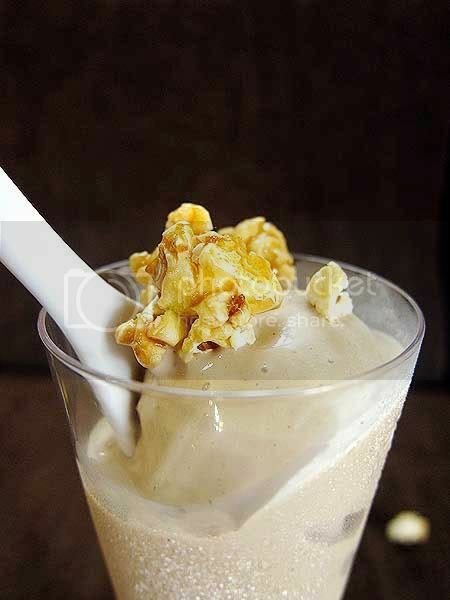 After making a couple of ice creams, I think I can make one without a recipe. You know, I have to say, I actually haven’t popped any popcorn before in my life. All my popcorn has been either from a cinema or from an amusement park. So I had to do some homework. Lol Popping popcorns isn’t rocket science. Heat up a saucepan with or without a dash of oil. 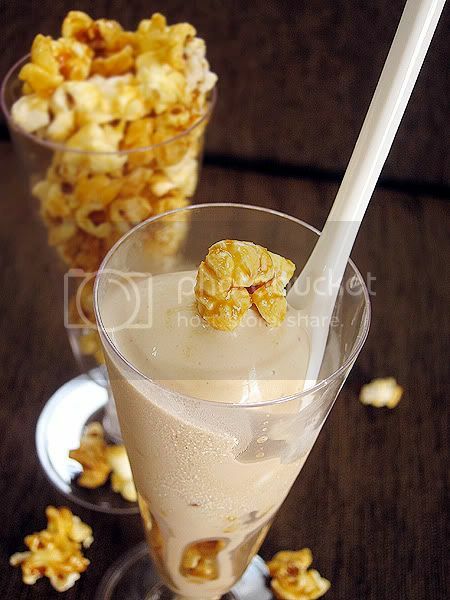 I added a tablespoon of brown sugar and a pinch of salt to it then added 1/2 cup of popcorn kernels. Then close the lid and count till 15. Then you’d hear some popping sounds. So then you lift up the pan and give it a shake. It will still continue popping for around 30 seconds or so. Open the lid slightly to let off some steam so the popcorn remains crunchy. Then when it’s done, pour out into a big bowl. I threw in some butter (I don’t know why… ) and tossed it. Then proceeded to make the ice cream. If you don’t want to make popcorns, just buy them from the store. Like the one in the pic, they’re actually leftovers from the cinema the day before. 1. 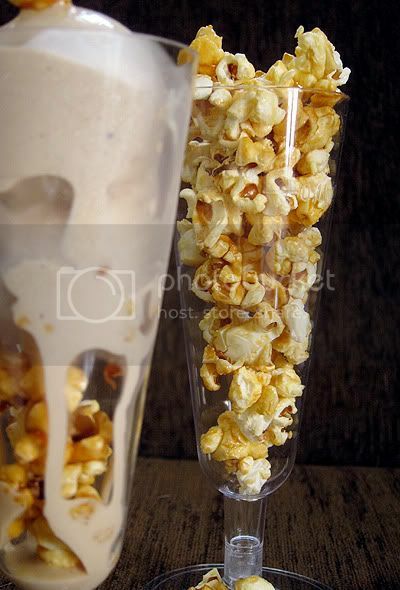 Put cream, milk, popcorn and half the sugar in a saucepan over medium heat. Cook, stirring for a few minutes until sugar has dissolved and the milk is just about to boil. 2. Whisk the egg yolks and remaining sugar in a large bowl. Gradually pour in 1/2 of the milk into the egg yolks while stirring till combined. 3. Strain the mixture and return egg mixture into saucepan and stir constantly over low heat till mixture thickens and coats the back of spoon. Discard the soggy popcorn. Remove from heat and leave to cool. 4.Cover and refrigerate until cool. Transfer to an ice cream machine and freeze according to the manufacturer’s instructions. Alternatively, transfer to a shallow metal tray and freeze, whisking every couple of hours until frozen and creamy. Freeze for 5 hours or overnight. Soften in the fridge for 10 minutes before serving. Feels like eating this and watch a movie instead, double checked. Hey there, just came from your old blog. can i just say , does anyone else think that first picture of the ice cream looks like a face? you left so much popcorn ??!! u are talented!!! love it.